Lock in a great price for Holiday Inn St Louis SW - Route 66 – rated 8.1 by recent guests! The showers were great and the soft towels were much appreciated. The room darkening drapes were perfect. We were also able to adjust the temperature of the room to our liking. The bar area was always hopping which we took as a sign of great community. Water stayed hot while showering. The indoor pool/ spa was kept up for the most part. The staff was amazing! From my first call through my check-out, they went above and beyond to make my stay one I will remember. Thank you Sharon and crew! Hot tub and pool was great. Glass shower was beautiful! The staff was super friendly and accommodating. We have 3 kids and took advantage of the continental breakfast. The set up was tidy and food was fresh, although not a huge spread of variety. I utilized their fitness center which was also clean and functional. Our family swam in the indoor heated pool and hot tub. All well kept! Thanks for a nice stay! We have stayed here often and staff is almost always friendly and helpful. (see below) The room is comfortable and the bar is convenient. We spent Sunday evening playing cards in the bar. We may have gotten a little loud but we had a great time. Staff was excellent and unit was clean. Some sticky substance on the floor but it could have been cleaner residue. The location of the hotel was great, and we liked the pillows. We enjoyed breakfast. The bed was nice. Our room was nice. Holiday Inn St Louis SW - Route 66 This rating is a reflection of how the property compares to the industry standard when it comes to price, facilities and services available. It's based on a self-evaluation by the property. Use this rating to help choose your stay! This St. Louis, Missouri hotel is located off Interstate 44 and is 12 mi from St. Louis city center. The hotel features an indoor and outdoor pool and a restaurant. 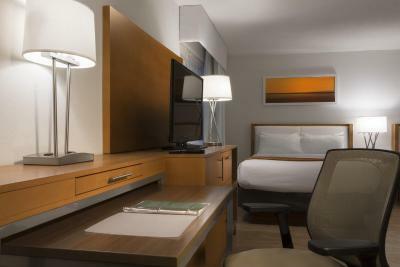 Holiday Inn St. Louis SW - Route 66 offers a 24-hour, full-service business center and free Wi-Fi. Guests can use the hot tub, gym, or the game room. Other available services include a free area shuttle within 5 mi of the hotel and laundry facilities. St. Louis SW - Route 66 Holiday Inn guest rooms feature cable TV with in-room films. Guests can also borrow films from the hotel’s collection. The spacious rooms also include a coffee maker and a work desk. The Magic House and the St. Louis Zoo are both within a 10-minute drive of the St. Louis SW - Route 66 Holiday Inn. St. Louis Science Center and West County Shopping Center are also close by. This property also has one of the top-rated locations in Crestwood! Guests are happier about it compared to other properties in the area. This property is also rated for the best value in Crestwood! Guests are getting more for their money when compared to other properties in this city. When would you like to stay at Holiday Inn St Louis SW - Route 66? Bed preferences cannot be guaranteed. Cable TV and tea and coffee-making facilities are provided in this room. This room features a seating area with sofa bed. This spacious suite overlooks the outdoor pool. This room has a loft with a whirlpool bathtub. 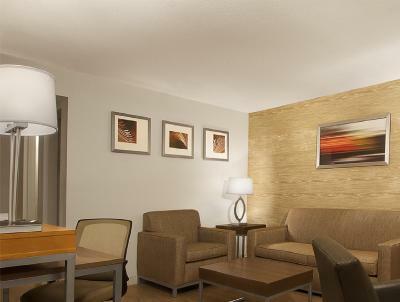 House Rules Holiday Inn St Louis SW - Route 66 takes special requests – add in the next step! Holiday Inn St Louis SW - Route 66 accepts these cards and reserves the right to temporarily hold an amount prior to arrival. More kcups in the room each morning. We did not actually get an opportunity to enjoy the breakfast. Our room price included breakfast however we were not informed how this took place upon registering. Our mornings were rushed and we did not take the time to inquire although it was in my thoughts. We had protein shakes with us so basically we were set. The kcups were a great addition however only two coffee kcups each morning. That is a rough start considering there were two adults. Coffee was available in the vestibule however that too ran dry. We did enjoy the comfort of the room however I am not sure the timeframe between our arrival and the previous persons stay. The floor was gritty to the point of wearing slippers was a must. There was dust on the Kleenex box. This all being said, I am only pointing these facts out because it was asked. When we checked in the restroom walls were dirty, hairs on the shower wall! There were stains on blankets/pillows. When going out for the day, I stopped at front desk and requested they change our linens and give us extra towels. When arriving back no extra towels, the beds were made but with same sheets. We attempted to call front desk but our phone didn’t work. After husband got back from front desk, someone came in and changed our beds. The night after we had this same issue! Paying 100.00 a night the service should be a top priority and it just wasn’t even after I gave them the benefit of the doubt. The service never changed. Bathroom was dirty. Breakfast was bad. Staff was phenomenal. Bathroom tub was still dirty and the breakfast was not good at all. Bathroom had no ventilation. Used Pool towels all over in pool area. Saturday night there were kids everywhere, unattended banging on our door and screaming until past the quiet hours. Sunday was great though! Room furniture was a bit dated. I was sad that there wasn't any continental breakfast. Housekeeping staff did a poor job. We had to ask for towels, Room was not vacuumed, Room was not cleaned or attended to one day and sheets were not changed. Staff appeared very unmotivated and were less than engaging. Location, price, quietness of the room. Ebony the front counter attendant was the best. The toilet in my room kept running. I had to take the lid off to adjust the flapper thing. What bothers me is the last two times I have stayed I have spoken with someone at the desk with a special request, but when I check in( both times) they were not able to meet it. I don't like being lied to or staff not communicating with each other.